Four-line poems lend a magical quality to a series of simple experiences witnessed once in a blue moon. Daniel’s childlike illustrations, done in pencil and colored with flat fields of acrylic gouache in rich colors, accompany each poem, serving to frame moments in nature as special events. The format allows readers to go slowly and serves as an excellent way for children to become aware of nonrhyming poetic forms. It also conveys the sense of wonder that comes when taking a quiet moment to appreciate that which is not immediately “entertaining” in the modern sense. 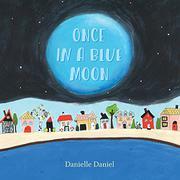 The repetition of the titular phrase, “Once in a blue moon,” and brevity of each poem make for a soothing bedtime read-aloud, but the book will also work well as a calm break in a busy day, and it is ripe with inspirations for further activities such as painting a similar scene and writing nonrhyming verses to reflect serene moments. Each “I” in the book can apply to children from many walks of life, as those depicted have different skin colors and hair textures and are in different environments in nature. Many may be close to readers’ own accessible experiences, while those that are different can inspire imagination about how other kids see the world.